More than ¾ of the territory of Kazakhstan take plains with the high from 100 to 300 meters above-sea level. In the frontier Southeast and East the Tien Shan ranges, The Dzungarian Alatau and the Altai Mountains of 3000 – 6995 m. (Khan Tengri Peak) high stretch. In the frontier West there is Pricaspian Depression, partly lying below sea level (the level of the Caspian sea is 27 meters). In the center of the country there are vast territories of the destroyed mountain system of the Kazakh shallow hills. 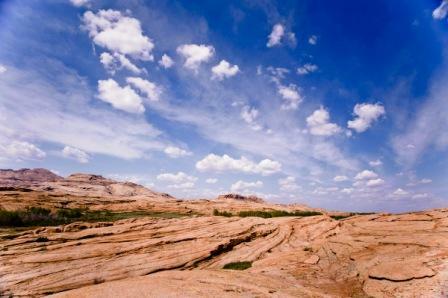 Within the plains there are sandy and clay deserts (Kyzyl Kum, Muyunkum, Betpak Dala), semi-deserts and dry steppes. For young mountains of the south-east the strong differentiation and high-altitude zone are inherent. In the north of the republic steppes and forest-steppes predominate. 23% of the territory (northern part) is suitable for agriculture, 70% - for pasturing cattle breeding. About 80% of the territory of the republic concerns to the blind regions and internal drainage basins. The Irtysh, Ishim and Tobol flowing in the north and north-east of the country belong to the basin of the Arctic Ocean. All the other major rivers on the territory of the country carry their waters to the closed inland drainages: the Ural – to the Caspian Sea, the Syr Darya – to the Aral Sea, the Ili - to the Lake Balkhash. Many small and medium rivers dry up in summer. The Caspian Sea is a part of the republic of Kazakhstan of the northeastern water area with the freshest water with small depths (5 -7 meters). Besides Kazakhstan, the Caspian Sea washes Russia, Azerbaijan, Iran and Turkmenistan. The Aral Sea is divided between Kazakhstan and Uzbekistan. It is a drying up basin, the area of which decreased half the size for the period of 1960 – 1995. The Lake Balkhash fully belongs to Kazakhstan. The basin has fresh Western water area and the salty Eastern one. The climate is sharply continental and dry. In the foothills and mountain regions the precipitation is from 500 to 1600 mm a year, in the steppe regions – 200 – 500 mm., in the deserts – 100 – 200 mm. The average temperature in January is from -18° С in the North to -3° С in the South; the average temperature in July is from 19° С in the North to 29° С in the South. The annual temperature drop is very high: in winter the temperature can decrease till -50° С, and in summer in places the surface temperature can reach 70° С. The daily temperature drop reaches 20–30° С.
Excepting the northern regions, the soil in Kazakhstan is poor and salty. On the whole the latitudinal zonality of soils is typical for the country: in the North - mould humus, in the South – chestnut, brown semidesert soils, takyrs and sands. In the mountains the brown, gray forest and mountain meadow black earth lands. 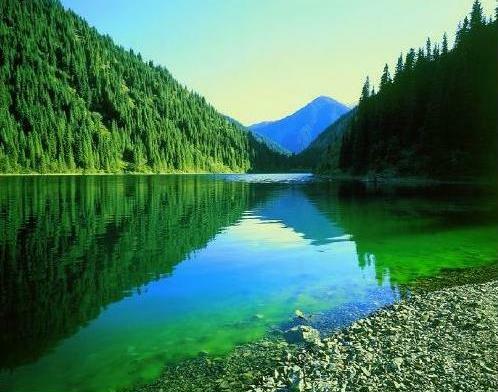 Forests take 3,5% of the territory of Kazakhstan. Mostly these are softwood forests, although birch, aspen, apple tree and fir thicket are met in the mountains. On the rest territory of the country there are forb and cereal, wormwood and cereal, wormwood and halophytic and desert vegetation. In the high mountains there are orohylile and alpine meadows. Fauna of Kazakhstan is peculiar. Insects and reptiles prevail in the deserts and semideserts. In the steppe zone you can meet a goitered gazelle, saiga, wolf, hare, fox, jackal, different rodents (mice, sousliks, and hamsters). Many Kazakh lakes are the constant or seasonable localities for geese, swans, ducks, seagulls and flamingo. The fauna in the mountains is more diverse. Bears, Caucasian goats, sheep, snow leopards, deer and many kinds of birds inhabit here. For the protection of wild nature the reserves in all nature zones – from deserts to highlands, are established.